The cuckoo call is connected to the time and the clock automatically goes silent in the evening hours. In the morning, the call is reactived and the clock calls again. At the full hour the cuckoo calls, the cuckoo door opens and the bird comes out, flapping his wings. The cuckoo calls the time / number of hours. This clock also has a music function, after the cuckoo call the clock plays a tune. This clock has a music movement which plays 12 different tunes alternatingly. The clock is completely made of wood, made in the Black Forest. This clock has a wooden dial (all wood), wooden clock hands, and also full wooden weights. For a quarz clock, this is a very high quality model. Size: 10.24 inches tall, 10.63 inches wide, 6.5 inches deep. 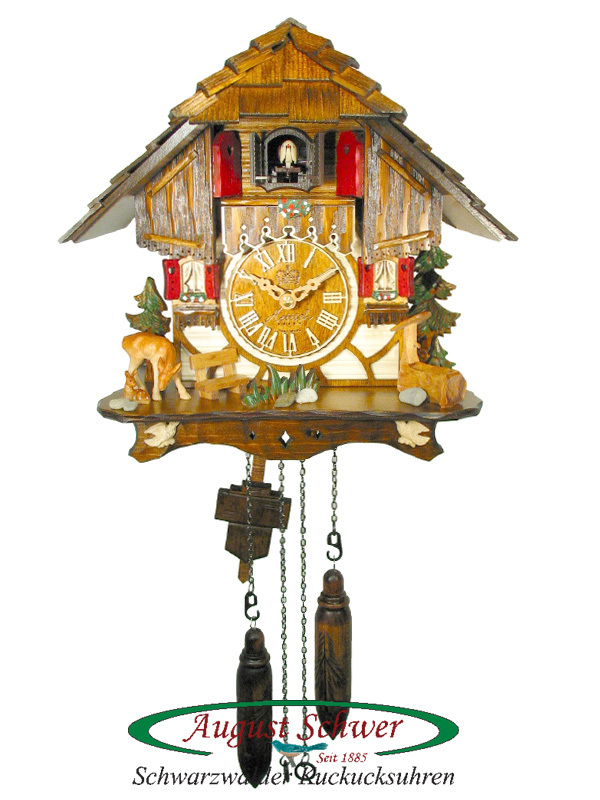 made by the Hettich Clock Factory, Black Forest.